Cardiac catheterization is a procedure that provides information to your physician on how well your heart is working. It evaluates the heart muscle, valves and coronary arteries; and allows for procedures to open blocked arteries. A thin, flexible tube called a catheter is inserted into a large blood vessel in your leg (groin) or arm that leads to your heart. The catheter allows your doctor to take pictures and perform tests inside your heart. During your cardiac catheterization, procedures may be completed such as angiography, angioplasty and stenting. Angiography involves using contrast dye and taking xray pictures of blood vessels that can show the location and severity of blockages in the vessels. 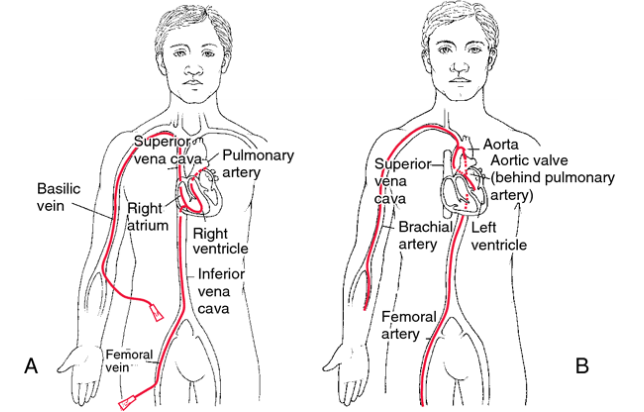 In angioplasty, the catheter is used to place a special balloon in the artery. The balloon is inflated and deflated to compress plaque and open the artery. A stent may be permanently placed in the narrow part of the artery to help keep the path of blood flow open. Tell your doctor what medications you are taking – including any over the counter medications, herbal remedies or supplements. You will be given instructions about what medications to take or stop before the procedure. The doctor will guide the catheter as it is threaded through the blood vessels and into the heart. You may feel some pressure, but you shouldn’t feel any pain. Depending on the procedures that follow, various instruments may be used and/or the catheter may be removed and replaced several times to be able to reach different parts of the heart or vessels.